Click on the loudspeaker icons to hear commentary samples from the many countries that Soundscape covers. Soundscape audio point of interest commentaries are being heard right now on long-distance coach journeys throughout the UK and Europe. Triggered automatically by GPS technology they explain about the history and culture of places being passed along the route in a light, entertaining way and aim to bring audio magic to what can be otherwise long, boring stretches of road. Soundscape commentaries are expertly researched, written and produced using multiple voice, music and sound effects. 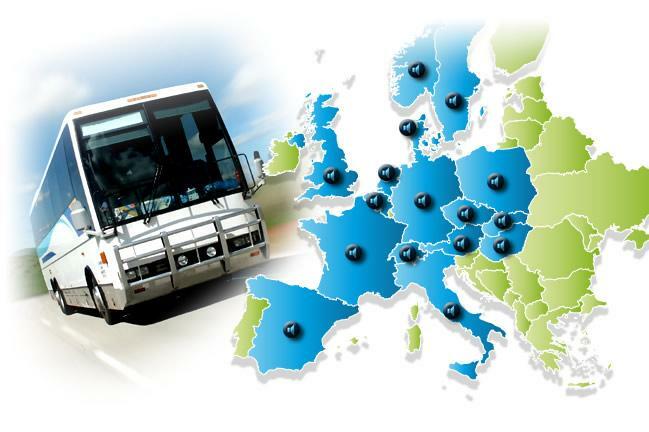 Our European commentaries include routings to Paris, Oslo, Stockholm, Copenhagen, Berlin, Wroclaw, Budapest, Munich, Salzburg, Vienna, Metz, Basel, Rome, Sorrento, Lyon, Montpellier and Barcelona. The Soundscape commentary library is expanding all the time as we move closer toward our goal of providing commentary accompaniment to all of the main travelled routes in Europe including the United Kingdom and Ireland.